Many of us are already acquainted with the importance of having a website to advertise our products or services and carve a niche in the Internet. However, we are also acquainted with how difficult it may be to design a website from scratch. You can promote your products or services through a website, as well as position them in search engines and create a marketing strategy. You will, nonetheless, have to follow a series of steps — detailed below — to be able to create a website that’s attractive enough. This is the first thing you must be sure about when willing to design a website. The world around us has become a little chaotic and the Internet is no exception. We must know which kind of website we are willing to create and what are we offering through it. Advertising, promotion, entertainment… All these have to be crystal clear to us before taking any further steps. Now that we are sure about what we are expecting from our website and know what it’s going to offer us, it’s high time we start preparing a prototype. This is to be done with paper and pencil and is an essential step in any kind of website development process. We’ll try to establish what the website will be doing when meeting different situations. We’ll determine which problems we may be running into or which kind of design is the best. Now it’s when we get our hands on the substantial part. It’s time to write down the different aspects included in our website. Where will the title, menu, and content be, how the footer will be… We’ll include both the measures and the main purpose of the website’s elements. We will thus create a conceptual map laying out where we are within the process and what is coming next. The website development process will remain tidy and the amount of possible errors kept as low as possible. It’s time to contact an expert designer. Now is the best time to get in touch with an expert designer, as we have already advanced quite a bit in our website’s development. He/she will analyse your idea and give your website the best looks. The expert will also carry out a series of corporate analysis to determine the font style, colours and kinds of images. The website will now finally start to be developed and we’ll eventually end up with everything necessary to have it online. When designing a website, we must always test it before publishing it on the Internet for the wider public. The reason behind this is to detect any possible flaws that it may have and ensure that everything is in place and especially that its features are working. Friends or relatives who have never seen our website can also be testers. This will provide insight into what users will be seeing and experiencing. Website analysis: Do we need to implement any changes? The last step before launching our website to the world is to analyse it and put improvements forth. We now face one of the most critical moments of the whole website development process. We’ll have to detect, analyse and repair any issues we might have come across in the previous stage. Finally, we must optimise all aspects of our website’s SEO. This way we’ll get it to the top of the search engines’ results. But let’s not hurry. You should continue reading the following section if you want your website’s design to look as good as possible. That’s why we are including a summary of the best designs in the list below. This has been one of the most widespread marketing strategies in web design during 2016. Videos have ended up becoming the key element of content marketing; they account for 70% of users’ Internet traffic. Websites containing videos are 50 times more likely to appear on the first page of the search results. Many studies show that to include a video in a website increases conversion rates. Videos are easy to consume: it’s easy to extract the message from them and to understand the concept. They convey a feeling of depth, 3D, rhythm, video… And all in a very natural way. The visitor will control the animations and actions with his clicks and mouse/trackpad movements. This style was invented by Walt Disney himself and was denominated multiplane camera in its time. It conferred a special depth to his animation films. The good old GIF has evolved into Cinemagraphs, which are pictures in which a slower repeated action occurs. These pictures are created with a kind of image editing software that elaborates an animated GIF in such a way that its movement is slow and repetitive. 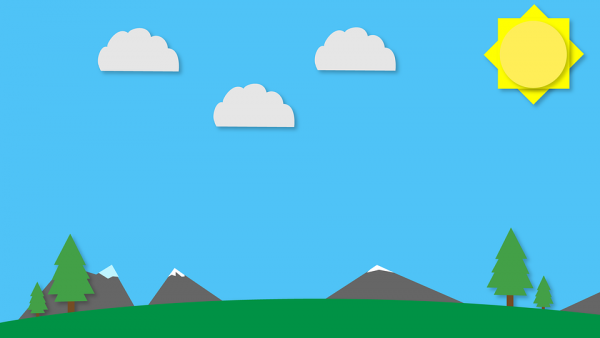 Flat design has been a classic ever since it was created in 2013. However, it has improved much over the years. For this reason we’ll now be discussing Flat Design 2.0. This design makes use of grids and geometry, plain and eye-catching colours, and flat texts and icons with simple images. It’s a very minimalist, modern and pure design present in the vast majority of professional website projects. Surely you have seen this icon in an app or in some website more than once. Its purpose is to expand or collapse a menu completely, allowing us to enjoy more space for our website. Its advantages are obvious: you can include a great deal of information while providing a consistent way of finding additional options at the same time. This effect consists in changing the appearance of a website’s element when you place the mouse pointer over it without selecting it. To wrap it up, we’ll now provide a list of concepts that sum up all that we’ve been discussing so far, just in case you have missed any of them. It’s the previous configuration process in the search for a solution. The idea is expressed in a solution or in an alternative to the current solution by means of sketches, drawings or schemes drawn in any of the formats available. A mock-up is a scale model or an actual-size model of a design or device. It can be used for demonstration, design evaluation or promotion purposes — amongst others. It’s especially necessary in the prototyping phase of digital projects such as websites or apps. It’s the amount of pixels that can be displayed on the screen. It’s obtained by multiplying the width by the height of the screen — measured in pixels — resulting in a relation called aspect ratio. It’s a digital image created by independent geometric objects, each of which is defined by the following mathematical attributes: shape, position and colour. This image format is completely different from that of bitmap images — also called matrix images — which are defined by pixels. Creating a website is not simple, as you will be well aware of. Therefore, everything must be carried out nicely to avoid possible issues. Please contact us if you have any doubts or are looking for a professional to develop your website. Why should my business have a website and how to create it?